Hadar Athletic is a factory, not a store. We believe that good people and quality materials make the best products. Sometimes that means using the latest technologies to improve our quality, but at other times it means slowing down and doing things by hand. We try to put the emphasis in manufacturing on quality and value — and in doing that we are able to offer our products in a wide range of sizes, styles and colors, so you get the product you’re looking for you. And, yes, we do custom orders. (1) Our products are sewn by skilled sewing machine operators. (2) In addition to our cut-foam football dummies and shapes, we offer a higher quality line of dummies with hand-rolled cores. 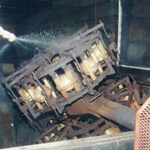 This produces a more durable product and recycles foam in the process. (3) We mold our own shotput shells, dummy bottoms, and other products. (4) Art work options include screen printing, computer printed vinyl, and Hadar’s exclusive multi-level stenciling. Hadar Athletic works with several mills to obtain the best fabrics for the many products we make. A short description of our major types of fabrics is provided here — complete details and specifications are available if needed for bids or quotes. Have your dealer contact the factory to request information. 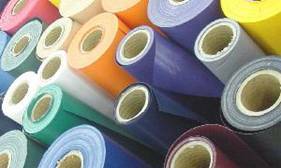 All of our vinyl fabrics and most of our nylon fabrics are available in several colors. Additionally, we can often order special colors if the volume of the order and the amount of time available permit us to do so. Since colors cannot be reproduced accurately on computer monitors, we encourage you to obtain color swatches from the factory if color matching is critical. Artwork, lettering and numbering are available on all of our fabric products. We use cotton duck canvas in our baseball bases and as an option in some other products, notably bags and football dummies. We use some lighter cotton and canvas materials in our umpire protectors and conditioning vests. Polyduck is a vinyl coated canvas that we use in some baseball bases. A heavy duty satin finish nylon and Cordura® nylon fabric are available as fabric options for bags and some other products. 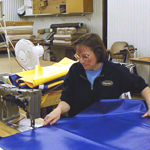 Vinyl coated nylon fabrics (sometimes called knife coated fabrics) are used in most of our football products, mats, bags, and other sewn products. This fabric consists of a tightly woven nylon base fabric (scrim), usually woven in such a way as to prevent tearing (Ripstop vinyl). 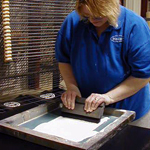 The scrim is then coated with colored vinyl and we purchase it from the mills on rolls such as shown in the foreground of the picture on the left. The vinyl coating can be either smooth or slightly textured. Vinyl material is classified by its weight per square yard — thus an 18 oz vinyl would be thicker and heavier than a 13 oz vinyl. Texture and each mill’s methods of coating affect other qualities such as flexibility and shine. The nylon scrim affects resistance to tearing and overall durability — sometimes more than the weight of the fabric does. Depending on the product we use seatbelt grade webbing or heavy-duty nylon webbing for handles, straps, and reinforcement on many of our sewn products. We have tried to indicate which products use seatbelt grade webbing in our catalog and on this website. 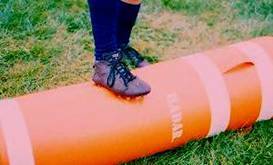 Hadar Athletic makes products that use several different types of foam. 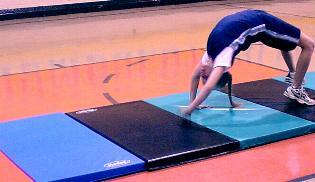 Often, especially with mats, the user must choose between foam types. The properties of each type of foam affect the feel, performance and appropriate use of the product. This page is designed to give the user a general outline of the issues involved in selecting the proper product for the desired activity. We use three basic types of foam in our products. In addition to the structure of the foam, the weight and density of the foam affect the performance and feel of the product. We try to select the highest quality of the most appropriate type of foam for each product we make based on how that product will be used. All of our foam is tested by the manufacturers, independent labs, and in.our in-house testing facilities. This page is designed to give the user a general outline of the issues involved in selecting the proper product for the desired activity. Close-Celled Foam, usually Crosslinked Polyethylene Foam, is characterized by air bubbles that are separate from each other. In general, it has a harder surface feel, but is better at absorbing impacts than open celled foam. Other factors such as foam density (pounds per cubic foot) and the structure of the plastic material itself also affect softness and impact absorbing ability. Close-celled crosslinked polyethylene foam is featured in our EMT Series mats and in other products where impact absorption is a must. Rebonded foam, sometimes called bonded foam, is recycled foam that is made by grinding old foam into small bits and bonding them back together. Rebonded foam is a heavier foam with good impact absorbing qualities. It is nearly as soft as open celled foam. We use rebonded foam in our RMT Series tumbling mats and in some baseball bases. In many of our products, we combine one or more types of foam to produce a result that we would not achieve if we were to limit ourselves to a single type of foam. For example, by bonding a layer of soft open celled foam to a sheet of impact absorbing foam, we produce our SMT series mats that feature a soft tumbling surface over a layer of close-celled foam for added impact absorption. We use this technique in our Agility series football dummies to provide a soft shoulder surface for the man hitting and extra protection for the man holding. Hadar Athletic provides nylon and vinyl covered athletic equipment in any of the colors shown at the right. However, you should be aware that the colors shown here are approximations only. Computer monitors vary in the way they display colors, and perception of color may change due to background and lighting conditions. Color swatches are available from the factory upon request. Additional colors are available when you order in sufficient quantity with ample lead time. Contact the factory for details.